Xoso Sports & Deep Eddy Vodka are teaming up to bring you some of the best sports & events in Sacramento. Be sure and head to the bar after your games and try one of the 6 Deep Eddy flavors always on special for Xoso players. "Net Results" is our Monday Volleyball champion, capping off their perfect 10-0 season with a sweep in the finals. Their skill was on full display all night, dropping just one set throughout the playoffs. That included wins of 21-10 and 21-7 in the championship game over "Amigos". 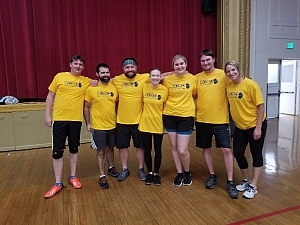 "Amigos" in their own right had a great season, picking up the first round playoff win over favored "Wonder Island" to make it to the finals. Earlier in the season they lost 3-0 to the very same team. However, come championship time, they were totally over-matched. To say "Net Results" was dominant this season would be an understatement, even by their standards. The two-time Monday night champion was the best team all season by a long-shot, racking up a +24 point differential. Only once ALL SEASON did they even lose a game, and that was in the first round of the playoffs to "Red Hot Sets". If not for that game, "Net Results" would have had a spotless season. Either way, it was still an incredible season for the back to back champions.